John Newman was born around 1780, probably in Yeovil. His father is unknown (but his paternal grandparents were Samuel Newman (c1760-1797) and Jane (c1740-1801)) and his mother was Elizabeth (we know all this from his mother's will, by which time his father had died). He had a younger brother James (b1790) and sister Jane (1796-1844). On 28 January 1821 he married Jane Garland (1778-1859) at St John's church. Jane was the daughter of Thomas Garland (1752-1814) and Jane née Foot (1753-1790). It appears that John and Jane did not have children. In the 1841 census John and Jane, by this time both in their sixties, were listed living in Hendford although this was not Hendford as we know it today, but the western side of Princes Street as far as Park Road. In fact they lived in the house that is now the Ask Italian restaurant. Living with them was Mary Garland (Jane's sister), John Birkley, William Birkley and Jane Birkley (the children of John's sister, Jane Birkley) together with a domestic servant. John Newman died in Yeovil in April 1844, aged 65. He was buried in St John's churchyard on 20 April 1844. The Tithe Apportionment of 1846 noted that his widow, Jane, was the owner of all the family land holdings as shown below and as listed in his will, also below. In the 1851 census Jane, by now aged 72, was listed as the head of the household and gave her occupation as a householder. Living with her was her sister Mary (a 70-year old spinster), her nephew John Berkley with his wife Mary Ann, their children Mary Jane, William and John, together with a domestic servant. Jane died in Yeovil in the spring of 1859, aged 81. The following schedule is taken from the 1846 Tithe Apportionment, by which time John Newman was dead and his widow Jane was listed as the owner of the lands and properties. In his will he refers to "my Dwellinghouse in Hendford (today's Ask Italian restaurant in Princes Street) .... in which I now reside with the Garden Barn Stable and Outhouses thereto belonging" which is Parcel 262. He does not refer to Parcel 290, the house and garden in Kingston. He refers to "my Dwellinghouse and Garden in Kingston.... now occupied by Miss Garland" which is Parcel 575. This is not Kingston the road, but Kingston the manor and the house and garden in question was one of only two houses in Goldcroft Lane. The location of the house was by the bend in Goldcroft on what is now the southern corner of the junction with Crofton Avenue (which didn't exist in the 1840s). He refers to Priddle's Orchard (Parcel 606) which is called Hewish Orchard in the Apportionment. He refers to "my Orchard in Huish which I lately purchased of the Reverend Henry Peter Daniell and the Close of Meadow Ground thereto adjoining". 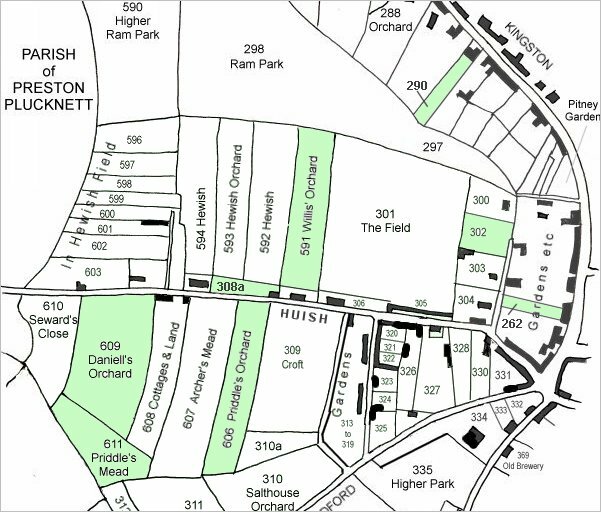 The orchard must be Parcel 609 (Daniell's Orchard) and the close of meadow must be Parcel 611 (Priddle's Mead). He refers to Cherry Orchard, Cuff's Orchard and "the piece of land at the bottom of Cuff's Orchard against Huish Lane". Cherry Orchard is most likely to be Parcel 302 "Orchard & Yard"
Cuff's Orchard is most likely Parcel 591 "Willis' Orchard"
"the piece of land at the bottom of Cuff's Orchard against Huish Lane" would therefore be Parcel 308a "Garden"
This is a portion of the 1842 Tithe Map showing, in green, the properties owned by John Newman. By the time of the 1846 Tithe Apportionment John was dead and his widow, Jane, was noted as the owner. She also still lived in their house in today's Princes Street - Parcel 262 at extreme right. Parcel 290, a house and garden at top right, had Thomas Bullen as tenant, while all the remaining parcels were occupied by Berkley Newman. A further house and garden, Parcel 574 off this map, was occupied by Sarah Garland - possibly Jane's sister. This Will was Proved &c in the Consistorial Archideaconal Court of Wells 18th May 1844 on the Oath of Jane Newman, Widow of the deceased, the ole Executrix above named. Effects under £1,000 (around £1,500,000 at today's value). 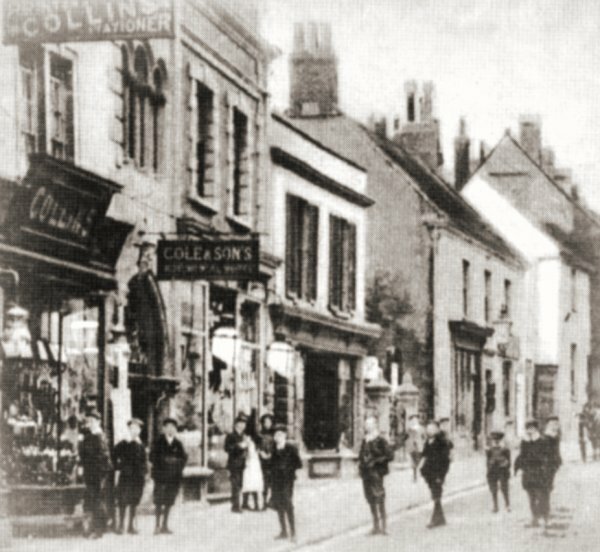 This photograph of the first few shops on the western side of Princes Street was taken around 1905. 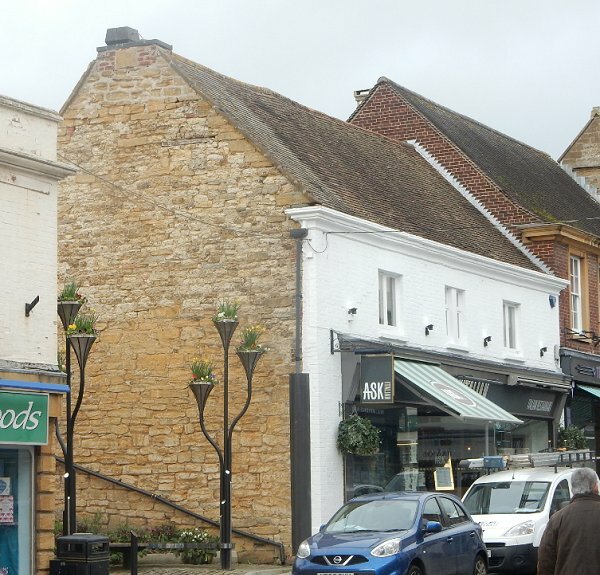 John Newman's house had been the property at right with three first floor windows. The building is now the Ask Italian restaurant. The record of John Newman's 1844 burial in the register of St John's church. John and Jane Newman's house in Princes Street, photographed in 2017.